Please call owner Tom at 417-299-0230. Boat is located in Branson, Missouri. To schedule a showing and/or test drive, please call. Pictures are from the 2013 updating. Custom built in 1999, this one-of-a-kind boat is built like a battleship! The 16 gauge galvanized steel hull was manufactured by Imperial Lifeboat & Davit in 1945. Hull was built at end of WWII and came off an aircraft carrier. All of the metal fastenings are flush brass rivots. This was developed by the well-known aviator, Howard Hughes. All of the flat seams of the steel hull are like brand new! Some seams were disassembled randomly for inspection and were found to be in outstanding condition. Designed for leisurely cruising, it is a great way to relax and unwind. Certainly eye-catching, it draws attention wherever it goes. It has always been sheltered from rain and snow. It's a great pleasure to operate. Very responsive: turns on a dime if need be. MUCH consideration was given to make this unique boat very maintenance free. Extremely economical to operate: miser on fuel (runs all day on 6 gallons of gas). Would make a great satellite office. Can be trailered with tandem axle trailer & towed with 1/2 ton pickup, easily. 24' double ender. 8' wide. Shallow 16" draft (plus or minus). 6,000 lbs, 15mph top speed. All 1" thick cedar plank decking is laid over 1.5" thick treated deck framing. Hand rails are steel covered with wood railing. 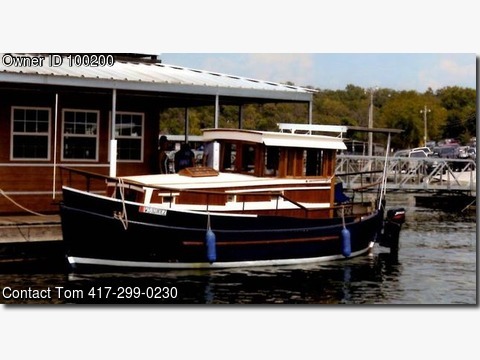 FEATURES: pilot house w/ all new controls & steering mechanism; ALL NEW galley, sleeping quarters, bathroom, kitchen, refinished 3/4" oak flooring. Newly installed prefinished oak flooring is 3/4" thick. Can stand in lower cabin and pilot house. Owner purchased the outboard motor new in 1999 and currently has less than 200 hours of use since. Comes with brand new boat cover. Boat is docked in new slip and could be kept there for year round use because lake never freezes! Branson is accessible by commercial airlines as it is a vacation destination. Boat has been completely updated and refitted in 2013.